16th August 2012Kids suffering from post-olympics boredom? ...Get them active this summer! For the last two weeks our children have been captivated by the Olympics, so there’ve been no calls of “I’m bored mum!” With the Olympics drawing to a close, and children inspired by the feats of our amazing GB team, why not channel their enthusiasm and encourage them to get active with these fab products from Mookie and TP Toys. If your son or daughter fancies themselves as the next Andy Murray or Laura Robson then treat them to the Pro Swingball to help them perfect their swing! The Pro-Swingball is ideal for competitive adults and older children or those who just enjoy racket games. With a larger base for stability and thicker tubing, the Pro Swingball is a whopping 1.75m high! This means players have to hit higher (perhaps even jump!) and the larger coil means the game will last longer than ever before. Available from www.swingball.co.uk with an RRP of £39.99. Perhaps your toddler thinks he can challenge cyclist Sir Chris Hoy. 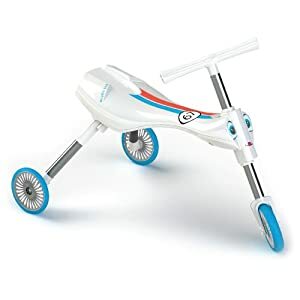 Why not get them started on this new Olympic inspired Scuttlebug – the innovative trike for toddlers from Mookie Toys. Portable and easy to use, the simple 3-step folding system allows the Scuttlebug to be ready in seconds so no patience required from either toddler or grown up!